UNITED NATIONS, August 19 -- With Reuters UN bureau having been shown with documents to be spoon-fed spies for the UN, and with UN Correspondents Association president Pamela Falk of CBS News being sycophant for the UN, her UNCA trolls started up again on Monday with personal anti-Press social media posts. Meanwhile in the briefing room Monday for UN Secretary General Ban Ki-moon's four-question press "encounter," the UN gave UNCA Executive Committee members the first two question, the first of which was widely ridiculed afterward. This is the UN's Alliance for so many things. Lou Charbonneau of Reuters, now a mere pass-through for the UK mission, has been shown to spy for the UN, handing them internal anti-Press UNCA documents three minutes after saying he wouldn't. Story here, audio here, document here. Because of the anonymous trolling, we note this, on the record: while Charbonneau's feed of corporate robot-tweets was dropped on August 13 from the Foreign Policy magazine "Twitterati 100," he maintains the claim on his twitter profile. Word to Reuters, including heretofore stonewalling Stephen J. Adler, Greg McCune, Paul Ingrassia and Walden Siew, isn't that false advertising? And what of the Reuter-ites' trolling? And spying for the UN? How is this acceptable? The UN Department of Public Information, which said months ago it would curb this personal trolling by its exclusive (censorship) partner has apparently done nothing. Instead, on June 20 DPI told Inner City Press it reserves the right to suspend or withdraw its accreditation for hanging a sign of the alternative Free UN Coalition for Access on the door of its shared office. 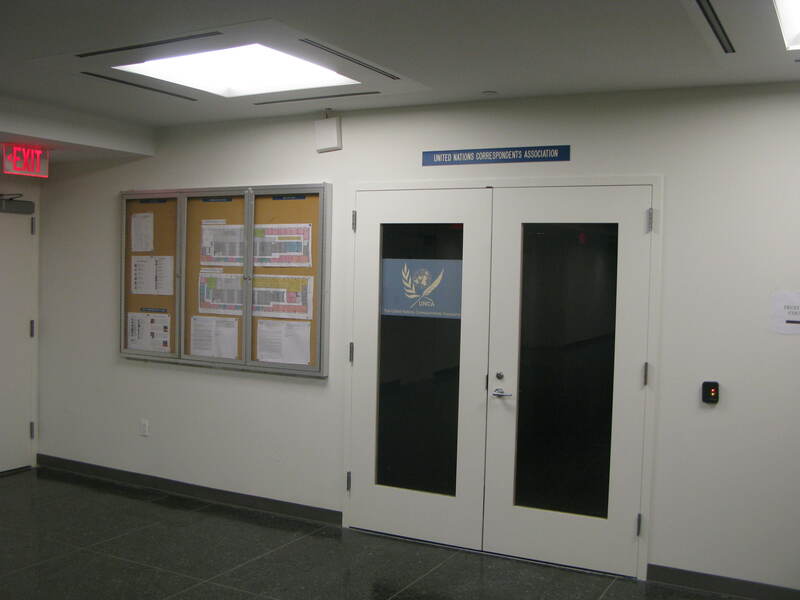 Meanwhile UNCA has five signs, and has had what was supposed to be a UN journalists club locked up and dark for weeks. 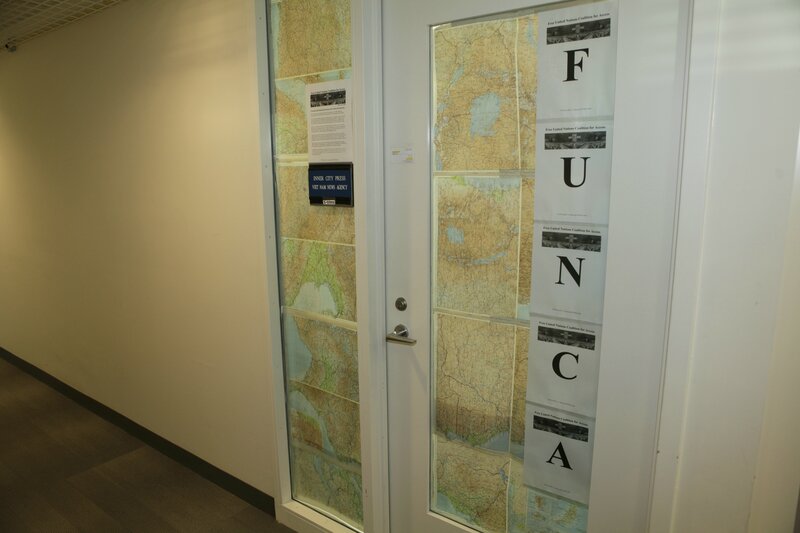 Inner City Press for FUNCA asked about that locked clubhouse, when UNCA used it for some in the Syrian opposition, publicizing it only to those which pay it money. The UN never explained if the events there are UN events, or why it remains locked. Nor when while threatening journalists it gave a non-journalist UNCA intern a "P" Press pass and let him into the briefing room and stakeout. Footnote: we have previously named him as the recipient of Charbonneau's "leak" on an internal UNCA anti-Press document, but tonight in fairness note that the UN's Stephane Dujarric did after week answer a question from the Free UN Coalition for Access (Inner City Press re-tweeted the answer, about Al Jazeera, here). We'll have more on this.